To Sum It Up: Finley Jayne has a dark side that gives her superhuman strength. Unfortunately, she is forced to use it against her employer, a wealthy lord, after she finds herself the object of his unwanted attention. Now without a job and a home, Finley is taken in by the kindly Griffin King, a duke with a secret power of his own. He views Finley’s strength as a blessing rather than a curse because he and his friends are all special in their own way. Griffin and his colleagues are dedicated to keeping Victorian England safe from the likes of villains like the mysterious Machinist, who is suspected of setting malfunctioning automatons loose on a series of crime sprees. The unlikely group, which now includes Finley, must track down The Machinist and put an end to his evil schemes. Review: This was pretty good, if a tad too long. 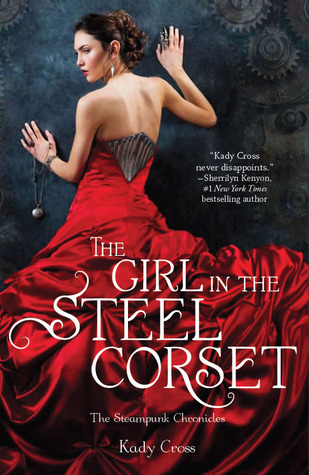 I loved the world that Kady Cross created, with all of its steam-powered and clockwork technology. I’m a big tech geek and a fan of all things Victorian, so this novel’s steampunk setting was just my sort of thing. I did, however, feel that the abundance of details sometimes bogged down the pacing. It’s obvious very early on in the book that we have a steampunk novel here, and in the later chapters it seems like we’re still being reminded of that, as though the setting hasn’t become second nature by now. I would have liked to have seen the focus shift more to the plot. I loved the idea of an Avengers-like team of individuals with special gifts working together to protect Victorian England. The point-of-view switches between the various members fairly smoothly. I really liked Griffin, Duke of Greythorne and the leader of the group, and Emily, its tech genius. Griffin’s colleague and best friend, Sam, was nearly killed by an automaton that stopped following its programming and turned homicidal, and Emily had to resort to some extreme scientific measures to save him. Sam is still brooding over not being quite as human as he once was, and I felt sorry for him, but his dour demeanor could also be tiresome at times. As for the newcomer to this little circle, Finley, I liked that she could pummel anyone who dared to mess with her, but like Sam, she, too, frayed my nerves occasionally. She repeatedly runs to the “safety” of a sketchy character named Jack Dandy, who heads up his own mysterious crew called the Dandies. Jack doesn’t have the greatest reputation, yet he’s Finley’s go-to guy whenever she needs a break from Griffin’s house. Now, I frequently root for the bad boys and I do like Jack, but hello, Finley. There’s a really nice duke who quite fancies you, and you keep shutting him out. Argh! The automatons immediately made me think of Cassandra Clare’s The Infernal Devices, but I’d say that The Girl in the Steel Corset definitely leans more towards science fiction than urban fantasy. While some parts of the story dragged, on the whole, it was an entertaining read. Each character possesses an interesting backstory; I found Griffin’s to be the most fascinating. He was the character whom I became the most invested in, and I’ll eventually check out The Girl in the Clockwork Collar to see what kind of adventure he and his friends embark on next. All in All: This wasn’t a quick read for me, and I thought that some parts could have been condensed, but I took a liking to most of the characters and the world. If you enjoy steampunk and don’t mind some lulls in the action, then this is probably worth checking out. Loved this! In Bk 2I think Finley got darker a little bit. Finley letting her dark side surface more sounds intriguing. I'm hoping to find out more about Jasper in the second book, too. I've been debating on starting this series now, or waiting until the final book has been published. I hadn't really read a lot of reviews, though, so I didn't know if it would be a good investment of my time. So I definitely appreciate your input! I hope it helped! The book had its ups and downs, but in the end, I thought it was worth reading.